Dave's Blog: Yet again we ask: Is it art? Yet again we ask: Is it art? When I was a young musician I moved to Palmerston North, attracted by the strong community of original and alternative music. However I soon realised that "alternative" was a euphemism for "talentless". Seriously, the whole scene was dominated by wannabes who couldn't be bothered actually learning an instrument. They simply found an easier way - buy a nasty cheap amp, get wasted and see what strange noises can be produced. Fun, but not music. I see much the same in contemporary art. The latest example comes courtesy of nearby Waikato Museum which recently awarded top prize in an art competition to a pile of rubbish. Artist Dane Mitchell couldn't be at the competition to enter himself so he left instructions to museum staff: Pilfer rubbish from other contestants and lay it on the floor. That effort netted him $15,000 first prize. My first surprise was that anyone could think of a pile of rubbish as worthy art. Not because it's rubbish, but because the concept is so hackneyed. 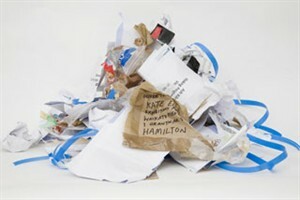 Google "rubbish as art" and wade through the ten million results. There's a whole sub-genre of artistic rubbish which may or may not have merit but one thing's for sure - Mitchell's work isn't in any way original. It's a totally weak imitation of far more interesting works dating back years. While we're discussing tired old cliches, how long are we supposed to wear the argument "It generates discussion and that's the point of art, so we're happy". Really? Even if the discussion is all about what a joke art has become? Art curators must be the only people in the world able to interpret widespread derision as a good result. Face it - this argument is nothing more than a last defense when you've been caught out. Competition judge Charlotte Huddleston said she was impressed at how Mitchell "responded to his situation" (i.e. being absent and making someone else create the entry). Hmmm. Let's say I want to enter a running race but I can't be there in person to do the actual running part. Should I be allowed to nominate another person to do it for me? I could leave specific instructions: "Go really fast and see if you can get to the end first". Perhaps this isn't a completely fair analogy but it illustrates a fair point - shouldn't the artist who enters a piece actually have made it? In my opinion Mitchell "responded to his situation" by cheating. He couldn't be there so he found a loophole. Not only is this cheating, it makes it quite clear that there's no real artistic merit in the work. He didn't invent this work to make a statement, he invented it because he needed a convenient way to make a proxy entry. He quite literally asked someone else to scrounge up the leftovers, dump it in a pile and call it art. I'm suspicious that the title is often the most important feature of an artwork. In this case it's called "Collateral". Ooh, how incisive. Yawn. The art world is widely believed to consist of self-serving tossers rorting the public purse. This kind of debacle is exactly why. I say it's time people in the art world started laughing at the naked emperor. This crap isn't art. Spare me the snooty BS, just deal with it. Start teaching people how to paint and sculpt instead of selling snake oil. I would say that in this case art has truly imitated life. Dane Mitchell's entry is total crap, a great representation/imitation of his artistic talent. One thing he does seem to be good at however...scamming the unbelievably stupid art community! Dane Mitchell....your art is beneath a joke, at least jokes have the potential to evoke a smile! And shame on you, Waikato Musuem, for promoting (not to mention rewarding!) such pathetic attempts.